This is genuine Rivoli Star Shape Swarovski Hotfix Crystal, which is manufactured in Austria. The size is 5mm and the colour is Crystal Color (001). Swarovski crystals are brighter and sparkling when compared to other crystals due to patented manufacturing processes. To produce a diamond-like eff.. This is genuine Rivoli Snowflake Shape Swarovski Hotfix Crystal, which is manufactured in Austria. The size is 5mm and the colour is Crystal Color (001). Swarovski crystals are brighter and sparkling when compared to other crystals due to patented manufacturing processes. To produce a diamond-lik.. 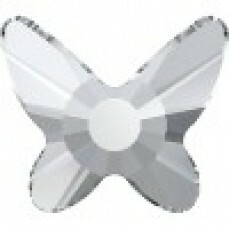 This is genuine Butterfly Shape Swarovski Hotfix Crystal, which is manufactured in Austria. The size is 8mm and the colour is Crystal Color (001). Swarovski crystals are brighter and sparkling when compared to other crystals due to patented manufacturing processes. To produce a diamond-like effec.. This is genuine Navette Shape Swarovski Hotfix Crystal, which is manufactured in Austria. The size is 8 x 4mm and the colour is Crystal AB (001AB). Swarovski crystals are brighter and sparkling when compared to other crystals due to patented manufacturing processes. To produce a diamond-like effe.. This is genuine Teardrop (Pear) Shape Swarovski Hotfix Crystal, which is manufactured in Austria. The size is 8 x 4.8mm and the colour is Crystal AB (001AB). Swarovski crystals are brighter and sparkling when compared to other crystals due to patented manufacturing processes. To produce a diamond.. This is genuine Chessboard Shape Swarovski Hotfix Crystal, which is manufactured in Austria. The size is 8mm and the colour is Crystal AB (001AB). Swarovski crystals are brighter and sparkling when compared to other crystals due to patented manufacturing processes. To produce a diamond-like .. This is genuine Margarita (Flower) Shape Swarovski Hotfix Crystal, which is manufactured in Austria. The size is SS34 (7mm) and the colour is Crystal AB (001AB). Swarovski crystals are brighter and sparkling when compared to other crystals due to patented manufacturing processes. To produce a dia.. This is genuine Edelweiss Shape Swarovski Hotfix Crystal, which is manufactured in Austria. The size is 10mm and the colour is Crystal AB (001AB). Swarovski crystals are brighter and sparkling when compared to other crystals due to patented manufacturing processes. To produce a diamond-like effec.. This is genuine Heart Shape Swarovski Hotfix Crystal, which is manufactured in Austria. The size is 6mm and the colour is Crystal AB (001AB). Swarovski crystals are brighter and sparkling when compared to other crystals due to patented manufacturing processes. To produce a diamond-like effect the.. This is genuine Rivoli Star Shape Swarovski Hotfix Crystal, which is manufactured in Austria. The size is 5mm and the colour is Crystal AB (001AB). Swarovski crystals are brighter and sparkling when compared to other crystals due to patented manufacturing processes. To produce a diamond-like effe.. This is genuine Rivoli Snowflake Shape Swarovski Hotfix Crystal, which is manufactured in Austria. The size is 5mm and the colour is Crystal AB (001AB). Swarovski crystals are brighter and sparkling when compared to other crystals due to patented manufacturing processes. To produce a diamond-like.. This is genuine Butterfly Shape Swarovski Hotfix Crystal, which is manufactured in Austria. The size is 8mm and the colour is Crystal AB (001AB). Swarovski crystals are brighter and sparkling when compared to other crystals due to patented manufacturing processes. To produce a diamond-like effect..